These smart yet brief quotations will help you get the most out of life. This list features short quotes about life and living: insights and musings from celebrities, authors, scientists and philosophers. Live your life to the fullest with a deeper understanding. The succinct expression of an idea can sometimes have the greatest impact. Enjoy these quotes and enjoy life! The kindest hearts have felt the most pains. To die is nothing; but it is terrible not to live. Are you afraid of the good you might do? Useful Tip: A thoughtful or amusing quote works well for a Quote of the Day in your blog. No notes. You speak from deep in your heart. It’s easy. Check out these short love quotations and sayings. Love doesn’t die; the men and women do. Curiosity is gluttony. To see is to devour. Check out these short humorous quotations and sayings. Holding onto your anger is like drinking poison and expecting the other person to die. To experience life you have to kind of face a lot of fears. Check out more short quotes about life, love, friendships and more. He who despairs is wrong. Experience, travel – these are an education in themselves. Do not grow to fond of your ideas or too certain of their truth. You don’t deserve what you don’t respect. If it is not necessary to decide, it is necessary not to decide. To be, or not to be,—that is the question. The sands are number’d that make up my life; Here must I stay, and here my life must end. The time of life is short; to spend that shortness basely were too long. So wise so young, they say, never do live long. 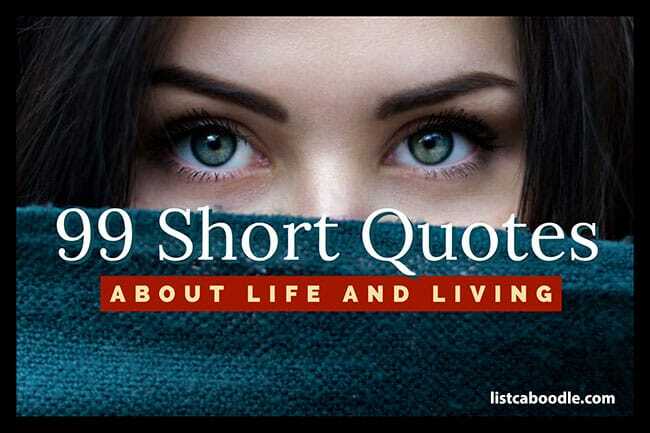 You have been reading 99 Short Quotes About Life & Living.